Come and sample Wildlife, Heritage and Sustainability projects. Join in with an annual Great British Beach Clean and Litter Survey. • Browse sustainability stands - Energy; Astronomy; Marine Wildlife; Diving; Aquatic Sports; Health and Lifestyle; Local Food; Water, Waste and Recycling. Participants must register in advance – email ttwbeachclean2014@gmail.com. See Coastal Wildlife – with Dave Fawcett from SWT. 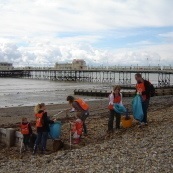 ‘Go Wild about Worthing’ on the beach during the clean-up. Join a Geology Nature Walk – with Geologist David Bone ‘Nature of Flint’ 11.15 am and 2.15 pm – meet at Splash Point. Join a Geology Heritage Walk – with Worthing Geological Society ‘Stone trail of the Town Centre and to the East’. 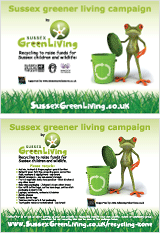 12.15 am and 3.15 pm – meet TIC/Visit Worthing Centre. Go Arty with Creative Waves team. Join in rubbish art activities and build wacky sculptures. Make bottle bricks for local school grounds projects. 10.30 Check in for BIG Clean-up. 10.45 Everyone meet for single BIG group briefing! 11.00 Split into subgroups within 2 teams – ‘PIER’ and ‘POOL’, depart beach. PIER to Splashpoint Team – largely EYE Sustainable Schools and families. Join in with rubbish art and other activities. Help save energy and redistribute waste for re-use and recycling by AWC. A notice of cancellation will be posted here http://transitiontownworthing.ning.com/events/ttw-big-beach-clean by 8.20am on the day if the weather conditions are too adverse for it to go ahead. You can call Pauline on 07985 913 602 or Polly on 07810178263, if necessary, on the day.